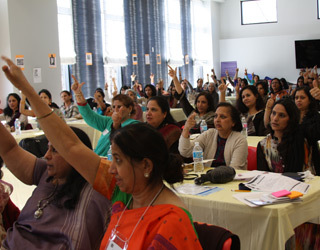 The World Hindu Council (Vishwa Hindu Parishad) of America (VHPA) – Atlanta chapter organized the 3rd annual Hindu Women’s Conference on February 27, 2016 at the beautiful Yugal Kunj Saffron Hall of the Radha Madhav Society in Duluth, GA. An event focused on empowering women through knowledge, the conference is a platform for addressing women’s issues, ranging from spirituality, health and fitness, to financial security and legal rights. The conference is open to women of all ages, and the organizers invite community leaders, inspirational speakers, and professionals to share their knowledge. The number of attendees is limited to 100 to keep the gathering cohesive and to promote greater personal interaction between audience and speakers. The conference began with a welcome address by coordinator Veena Katdare, who then invited Kusum Khurana, President of VHPA – Atlanta to address the gathering. The traditional lamp lighting ceremony by Smt. Anagha Srinivasan, wife of Consul Shri R. Srinivasan, was followed by Ganesh and Saraswati Vandana. The keynote speech was delivered by Dr. Seshu Sarma, faculty at Morehouse College of Medicine, a gifted orator, talented musician, prolific writer, and recipient of a “25 Most Influential Asian Americans in Georgia” award. Dr. Sarma addressed "Karmayog in America", talking about issues faced by Hindu women today, living and raising their kids in the US, balancing religious beliefs and cultural practices with mainstream American society. She spoke about practicing the religion of humanity, quoting “manav seva, madhav seva”—service to humanity is service to God. She also emphasized that children should be taught the importance of leading a good life rather than just a successful life. A powerful message when teaching spirituality to kids was that while prayer might not guarantee fortune, it will certainly bring fortitude, giving them the strength to pick themselves up and start again, should they fail. Dr. Sarma’s speech was followed by a brief introduction to VHPA and its various volunteering activities. Expounding on the merits of volunteerism, Ujjwala Brahme, an IT professional and dedicated volunteer with Susan G Komen, led a session on the significance of service. Participants were handed a survey asking if, where, and how they volunteered and what motivated them. Discussion then touched several aspects—one being that Indians are reluctant to volunteer outside their community on the apprehension of “not fitting in.” While some disagreed, citing examples of parents volunteering in schools, the discussion did call for some introspection on the part of the Indian community at large to be more involved in mainstream causes. The session brought home the fact that volunteerism does not just help others; it is an enriching experience, giving a sense of purpose and fulfillment to the doer, too, making it a perfect win-win situation. The theme of this year’s conference was family wellness and how to deal with the factors that adversely affect a woman or her family. A common issue faced by women is emotional distress, anxiety and depression. Discussing mental health issues has long been a taboo in Indian society. Patients and family members, more often than not, fail to reach out for help, keeping issues under wraps rather than getting medical advice. Another concern on the rise among families is substance abuse, especially among teenagers. Dr. Jyothi Mattam, a board certified practicing psychiatrist, addressed these issues and offered advice. When asked about the merits of choosing a physician of Indian origin, Dr. Mattam clarified that cultural competence of the doctor, meaning familiarity with cultural background of the patient, could play a significant role in treating mental health related issues. Her advice to families dealing with drug abuse was to act sooner rather than later, to be able to identify the symptoms of substance abuse early on and take remedial actions, and not be in denial. Indian society places a great importance on family; this reflects in the success of the institution of marriage among Indian Americans. However, no society is perfect, and issues such as domestic violence, abuse, and divorce do claim their victims every now and then. Indian women living abroad and in abusive relationships are especially vulnerable. In a session devoted to legal matters, Sharmila Nambiar, an experienced attorney specializing in family and immigration law spoke at length about legal rights of women in divorce cases. The session gave valuable insight into Georgia laws, with the hope that the attendees could share the information with anyone in need. 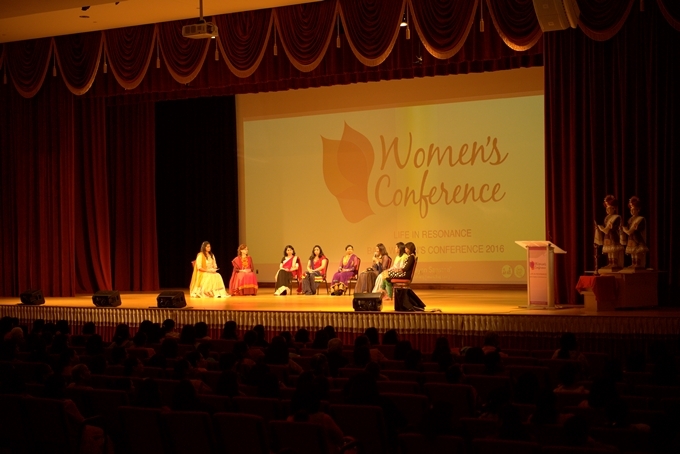 An important point to be noted here is that the Hindu Women’s Network, the force behind the conference, does provide a support system for women in need. Participants were treated to a delicious lunch by the volunteers of Yugal Kunj, after which the conference resumed with a 10 minute yog nidra, a relaxation technique focusing on breathing, which serves to relax and rejuvenate mind and body. Postlunch sessions included a talk on retirement planning by Manohar Kasetty, Financial Services Representative, Metlife Premier Client Group. In a typical patriarchal Indian family, the majority of women, whether working or stay-at-home, tend to ignore financial aspects of managing a family. This fact was only too glaringly obvious when Mr. Kasetty asked how many of the attendees had ever taken a look at their social security benefits statement—a mere three hands went up. This segment of the conference was aimed at raising financial awareness, giving women tools to manage their finances if the need arose. Mr. Kasetty navigated the complex topic with illustrative examples and helpful slides, and fielded questions from the audience. The next session touched upon women’s health issues. Women in general, and Indian women more so, usually put their family’s welfare above their own, often neglecting nagging personal health concerns. The last speaker of the day, Dr. Satish Nair, highlighted the importance of diet and exercise to fix common ailments faced by women. Dr. Nair, a doctor of naturopathy and an effective speaker with a great sense of humor, gave an engaging and informative lecture. He stressed the need to strengthen the core and remove the root cause of illnesses, and urged women to take responsibility of their own health; most importantly, stop blaming heredity for their ailments! The conference concluded with a short survey on social media consciousness, asking how participants would react to a variety of messages circulating on social media. Cases in point were rumors about diseases or offensive jokes targeting religious scriptures or certain communities. The survey revealed that most women exercised restraint in spreading such messages, checking the reliability of a source and in some cases, even calling out the person who posts offensive messages. On the topic of jokes, one of the participants correctly pointed out that we should not have to forgo opportunities to laugh, even at ourselves; however, it was certainly a fine line to walk. 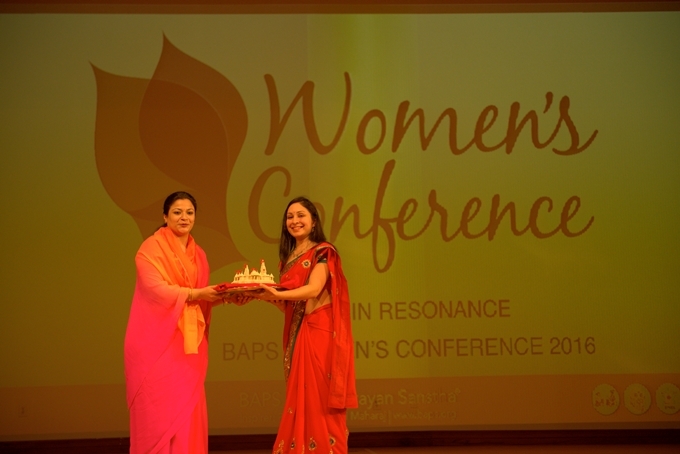 The day-long conference ended with a vote of thanks, followed by VHPA Prarthana, a prayer for world peace. The conference was made possible by the generous sponsorship from Manohar Kasetty of Metlife Premier Client Group, Sharmila Nambiar, Attorney at Law, senior care center Apna Ghar Home Care, Aim High SAT, and Raksha. The conference was a huge success, based on the feedback received from the 100-plus participants. It is said that “Any time women come together with a collective intention, it's a powerful thing.” Harnessing this power of collective intent to strengthen women socially, spiritually, and physiologically, will effect positive changes, not just in the lives of women, but in the entire world.